Thanksgiving has come and gone and this year I am thankful for many things — including my favorites of the week! The first favorite I am thankful for is an update from Donna Gruber (@dygruber), linking to Queen College’s Hybrid Bootcamp Winter 2011: Call for Participants page. 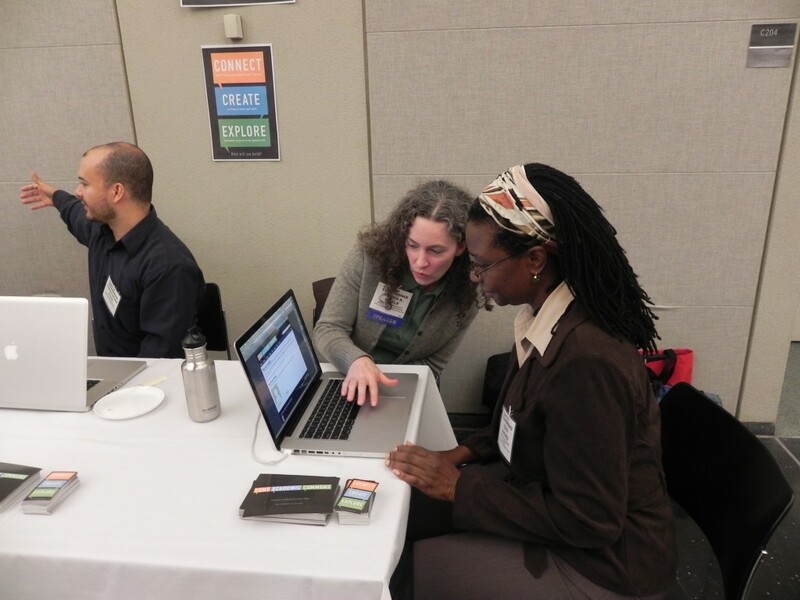 Queens College’s Center for Teaching and Learning is inviting faculty to participate in the second round of their mentoring program that focuses on the development of hybrid courses to be taught Fall 2011. If you have any questions, please contact Michelle Fraboni (@mfraboni, michelle.fraboni@qc.cuny.edu, 718.997.5324). The deadline is Wednesday, December 15th so be sure to mark your calendar! Speaking of of which, you should also mark your calendar for my next favorite posted on the CUNY Games Network — a demo of an Emergency Shelter Course in Second Life. On Wednesday, December 15th Andrew Bowarsky from CUNY School of Professional Studies will co-present with Anders Gronstedt from the Grondtedt Group on NYC’s Emergency Management course, which utilizes the Second Life platform. Second Life is a 3D virtual world where multiple users can connect in real time. Attend the presentation either in-person at the Graduate Center or participate online as an avatar in Second Life at 11a.m. on December 15th. Those interested, please contact @aboyarsky at aboyarsky@gc.cuny.edu. My next favorite this week is from Maura Smale, who also posted on the CUNY Games Network. dedicated to thoughtfully exploring and discussing the intersection of cultural heritage (very broadly defined) and games/meaningful play (equally broadly defined). Authors not only span many academic fields, but across the entire country — representing multiple perspectives on complex cultural and technological issues. Thanks for sharing @msmale! Next up this week is a helpful post from Shawn M. on the WordPress HELP!! forum. Soon after member @shirablum posted a question about problems she was experiencing installing the Google Calendar plug-in on her WordPress blog, Shawn and I worked together on the forum to trouble-shoot. Shawn posted some great instructions which laid out how to activate the plug-in as a sidebar widget and I explained how to display events on a specific page. If you’re interested in activating this plug-in on your blog, I would highly recommend reading this helpful forum thread. Many thanks @shawnm! The last favorite activity that I am thankful for a wiki edit from Lee Hachadorian (@leehach) on the Educational Blogs wiki page. 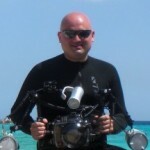 Many thanks Lee for not only have a fantastically great profile picture, but for contributing some great links to the Education Blogs wiki! 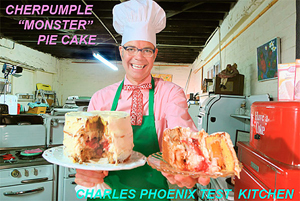 And now for some Cherpumple Monster Pie – is your stomach turning too?! Hello CUNYs and welcome to the second installment of “Favorites of the Week” (minus the video bonus). With so many great activities running rampant on the Commons I admit that it took some time to narrow my favorites down to five this week… so I decided to go with seven! First up is an update posted by CUNY’s University Director on Academic Technology, George Otte. 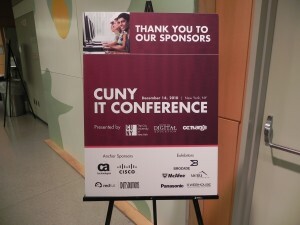 George posts about the Agenda for Day 1 and the Agenda for Day 2 for the 9th Annual CUNY IT Conference. I’m certainly looking forward to presenting at John Jay on 12/3 and attending the 12/14 event at the Grad Center. Thanks for posting @gotte, hope to see you there! Next up is an update from Donna Gruber, who posted an update about a Tech Tuesday presentation at Queens College on 11/9. In her update, Donna links to a fantastic presentation from Rowena Lee @rowenali. Professor Lee’s presentation highlights social media’s role in reshaping instruction — from communication transformation to challenges facing both instructors and learners (and much more). Even though I was not able to attend the presentation at Queens College, I’m grateful that Donna posted this update so I could view this wonderful presentation. Thanks @dygruber! My next favorite this week is an update posted by, well… me. I posted an update in which I mentioned @msmale, thus sending her a public message on the Commons. I wrote to Maura about not being able to attend the Rip: Remix Manifesto film screening during Open Access Week 2010 and, because Maura is awesome, she replied to my update posting a link to the film that I missed. You’re a champion for the cause @msmale, thanks for sharing! 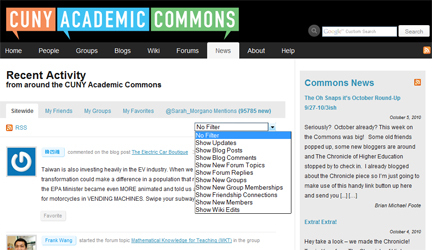 Next up is a forum post from CUNY Academic Commons Project Director Matt Gold to the group Creative Commons & Copyright: Resources for Teaching Faculty. 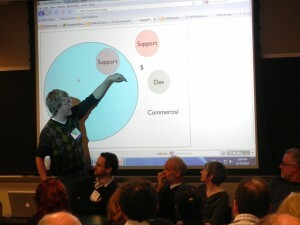 In this forum post Matt explains to the group members that their group is now the featured group on the Commons home page, thus bringing some well deserved attention to the wiki page: Creative Commons Copyright Resources WIKI. This wiki page is a collaborative resource that was started by the LaGuardia Center for Teaching and Learning and the Library. Of course there’s always room for more resources on any wiki page, so feel free to add to this list! My next favorite this week is a wiki edit from Charlie Edwards called Blogs to Follow. I’m very grateful to have come across this page, which was created as part of the Digital Humanities Resource Guide. This wiki page includes a brief selection of assorted bloggers, blogs for Center/Institutions, and CUNY blogs. I’m definitely going to add some of these to my blogroll! Readers, please help build out this list, by discipline/area of focus. The next favorite on my list is a blog post from Rob Laurich called Pat’s Papers – a unique scanning of today’s newspapers. Rob posts about NY1’s Pat Kiernan bringing his In the Papers segment to the Web. The website Pat’s Papers delivers the best daily stories ranging from international news to domestic politics to science to gossip. Thanks for sharing @madlibrarian! Wrapping up my favorites this week is a forum post by John Boy to the group Open Access Publishing Network at CUNY. Posting the topic “A Free Culture chapter at the Grad Center?“, John reaches out to other Graduate Center students, academics and activists passionate about creating a participatory and innovative society. For more information, visit: http://opencuny.org/freeculture/2010/11/10/free-culture-chapter. If anyone is interested in getting involved, please send a message to @jboy or post a reply to the group. One of the nifty features that @boonebgorges added to the CUNY Academic Commons towards the end of last semester is called My Favorites. This BuddyPress plug-in allows members to go through the activity stream of “My Commons” and the News page marking items of interest for further reading — thus extending their personal learning network. I like to take a few minutes each day to look through the news activity stream and bookmark group updates, wiki edits, forum threads, blog posts and mentions so I can look at them more closely when I have some free time. And, now that I have some free time, I wanted to share with you my favorites this week. Please feel free to watch the webisode, read the blog or both! 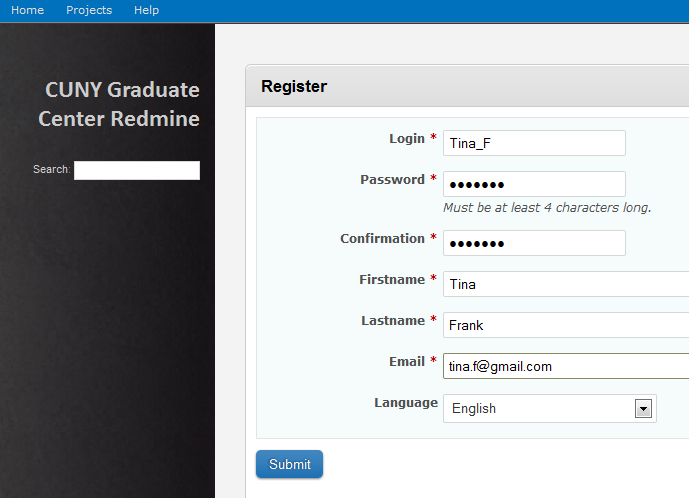 First up is a forum post for the CUNY Games Network, posted by Kimon Keramidas. “it’s hard to deny that structuring learning experiences around frustration/reward dynamics can lead to engaged learners”. Both of these articles discuss the benefits of “gamification”, which utilizes game design concepts to get people to participate and enjoy things that they normally wouldn’t. The second article, written by Leigh Alexander, highlights her fear about people not being able to exist spontaneously because they will become too dependant on these receiving positive feedback for everything. Great forum post, thanks for sharing @kkeramidas! My next favorite is a blog post written by our very own community facilitator Brian Foote entitled “Statement of Purpose“. Next up is the activity of Scott Voth, who edited the wiki page “Privacy on the Commons“. This wiki page in the “Help” category has a lot of great information for members about Wiki Privacy, Blog Privacy and Group Privacy. Now if I need to get information about privacy on the Commons I know just where to go, thanks @scottvoth! I’ll end my Favorites of the Week on a blog post written by Rob Laurich entitled “Will Newsweek Survive?”. In his post, Rob explains that the magazine Newsweek was recently sold for an entire dollar to 92 year old tycoon Sidney Harman. He also links to New York Magazine’s article “Newsboy“, where author Steve Fishman explains the drama behind the deal and leaves us wondering about Newsweek’s uncertain future. Thanks for blogging about this @madlibrarian! In staying with the whole “sharing is caring” theme of this blog, what are some of your Favorites?? Please feel free to share one by adding your comment below! Well it’s officially November — do you know what that means? A new project of mine called MY FAVORITES of the Week — a series of posts and podcasts which will highlight my favorite things happening on the CUNY Academic Commons. Be sure to check back this weekend for my first MY FAVORITES of the Week post! If you find yourself without an abundance of free time just scroll through the activity stream and select the “Favorite” tab under the items you want to bookmark for future reference. You can access these bookmarked items by selecting the “My Favorites” tab. Don’t want to search through the activity stream, but want to find out what’s new? We’ve got you covered! 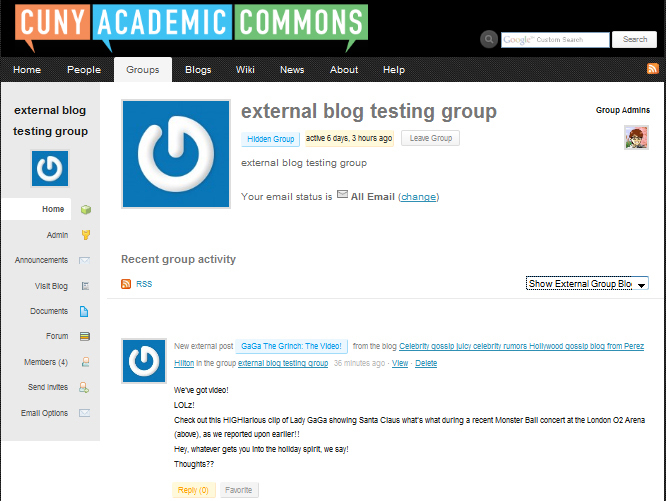 On the right side of the News page you can view recent posts from the Academic Commons News blog, Academic Commons Development blog and Twitter feed. Last week, the Commons bought a few iPads for the Community Team to experiment with and after spending some one-on-one time with an iPad and reading some great resources I wanted to write a review — 6 degrees style. *This is an overview of my experience thus far, incorporating information from member’s posts as well as outside resources and opinion. Matt Gold (@admin) posted this flowchart on the Academic Commons Project Management Base Camp back in April as a visual resource for creating new help documents on the Commons. Luckily, I’ve been beating the odds of this flowchart, but I often think of it as I eagerly await the back-ordered case! Why does Apple need my credit card information?? I use my Zune and Zune Pass to satisfy my music needs (in addition to Pandora), so I was a little disappointed that I had to download iTunes on my computer again in order to start the iPad. I had to create an account and give my credit card information… which I did … because I didn’t really have a choice. After forking over some personal information I was finally ready to see what this iPad thing was all about and why Obama wasn’t a fan! In addition to @omanreagan’s ipad posts from his blog about Apple technology, Michael has also written a blog post about “religion applications available for the iPad” from his blog about interdisciplinary studies in Religion. Talk about a ‘tools of empowerment’ — good stuff Michael, thanks for sharing! Calendar (pre-installed) This is your basic calendar. I’m able to keep myself on a tight schedule with reminders and repeating events. It’s not as customizable as I was hoping for (no task organizer). Mail (pre-installed) I’m able to sync multiple Gmail accounts as well as my CUNY email. Bonus. Videos>Podcasts (pre-installed>downloaded via iTunes) I’m currently learning how to fix redeye from the Photoshop//Power Tips & Tricks Podcast. I wish the iPad had the ability to go outside of iTunes… non-jailbreaking style. Todo ($4.99) While I was hoping this app was going to be free (or included within the Calendar app) I am glad I downloaded it! Todo helps me keep track of multiple projects both at home and at work and can send reminders via email. Highly recommended. Pages ($9.99) Mac’s version of Microsoft Word. You can use templates and have greater control over the layout and font style than you can with Notes. Keynote ($9.99) Syncs great with Mac Keynotes. I am able to edit presentations (with limited capabilities). iBooks (free) I was able to download a lot of free books by typing “free” into the search bar. Free Books (free) The name says it all — good stuff! Pandora (free) I can listen to a custom generated mix (unfortunately not while doing anything else on the iPad… without jailbreaking it). Pocket Pond (free) Watching goldfish swim and interacting with them is extremely calming after a long day at the office. Disney Digital Books: Toy Story (free) I am able to multitask — I can some work done at home while providing interactive entertainment for my pre-schooler! Siri (free) Possibly my favorite app thus far! (see video below). The speech recognition and overall intuitive nature of this app is incredible! My favorite part is when you say “remember,…” and it will send your speech to your email… or saying “tweet” and your twitter status update bar is brought up for you to do just that. This was originally created for the iPhone. Thanks to Adam S. Wandt’s post we also now know how to shop for our groceries in under two minutes using the Fresh Direct app! In non-iPad app related news I also share @awandt’s feelings of disappointment that the iPad has no forward facing camera and wouldn’t be surprised if AT&T network-related concerns were at the root of this decision. This camera (or lack-there-of) news was also revealed in @jugoretz’s post: Early iPod Thoughts. There are some great aspects of the iPad and the overall intuitive nature is very user-friendly. 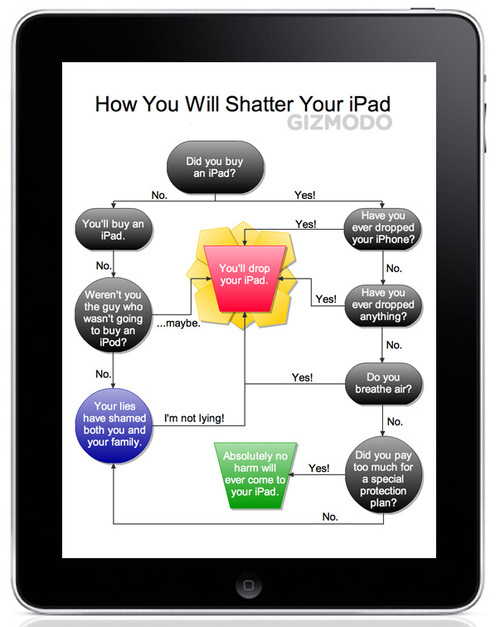 There are also many features that fall short of what a truly innovative tool the iPad should be. Lastly, the question that everyone is asking … or perhaps just @brianfoote — WILL IT BLEND?? ?